I’m going to become a Great Aunt in the next few weeks, it makes me feel very old as I had a Great Aunt Margaret when I was little and she seemed ancient and quite formidable! Besides making me feel old, it of course gave me the opportunity to make a baby quilt. 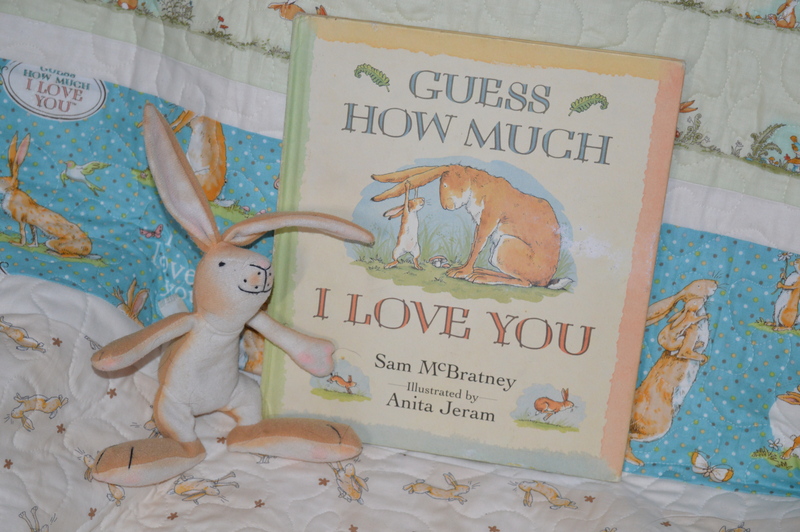 One of my favourite children’s books when my two were little was Guess How Much I Love You, the story of two nut-brown hares which finishes with the wonderful line of “I love you to the moon and back”. It had only just been published when my two were little, in fact I think mine is a first edition! This is a fabric range based on the illustrations of the book. 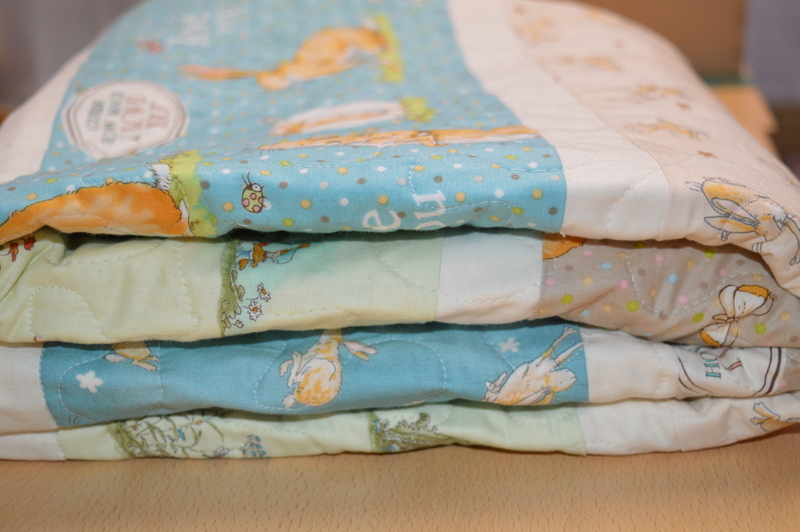 I used a very simple free quilt pattern by Lo, Ray & Me as it meant I didn’t have to cut the hares up too much! 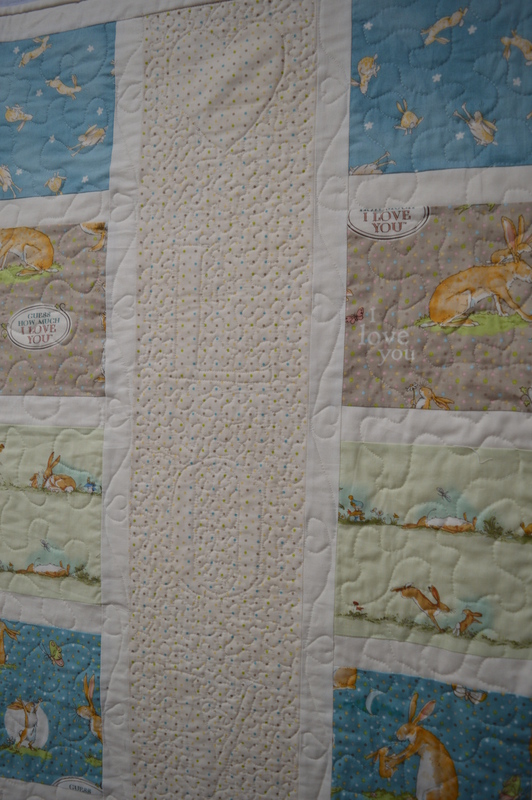 I also fussy cut some of the 6″ squares to get the hares in a good place. The quilt went together pretty easily, my only hiccup came when I tried to get away without measuring a border properly, I got the seam ripper out and stitched it properly second time round! When it came to quilting I decided I wanted to quilt a word down the vertical strip. I had some lovely suggestions from you all of possible words but I decided to stick with my original plan of LOVE as it fitted in with the books title. I carefully drew the letters on some paper, trying to work out the size and the width of the lettering. Once I was happy I then had to transfer them onto the actual quilt. I had a little bit of a brainwave and used freezer paper, tracing round, cutting out and ironing on, all I had to do was stitch round the shapes. It sort of three-quarters worked as I found the freezer paper didn’t like the fabric bending at all, so I did have to re-iron some of the letters, but it did give me a neat outline to stitch round. I stitched a close meander round the letters, adding a heart top and bottom. I felt it needed a border of some kind between this strip and the rest of the quilt, so I stitched a wavy line of hearts down each side. The rest of the quilt is in a bigger meander. 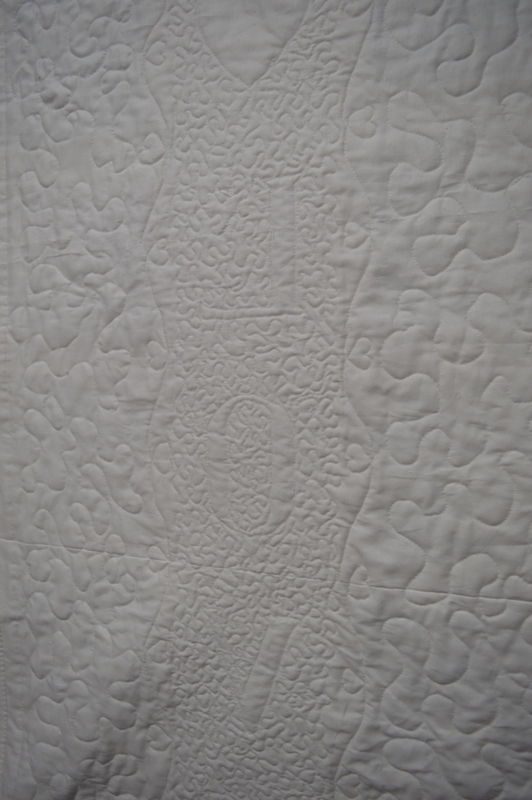 I was pretty pleased with the quilting, I love how the lettering shows up on the back and more subtly on the front. All I had to do then was binding the edge and a label. I spent a pleasant evening hand-stitching the binding down, I rather enjoy this part of a quilt, I can get into quite a relaxing stitching rhythm, my mind can wander all over the place whilst I’m stitching the binding! 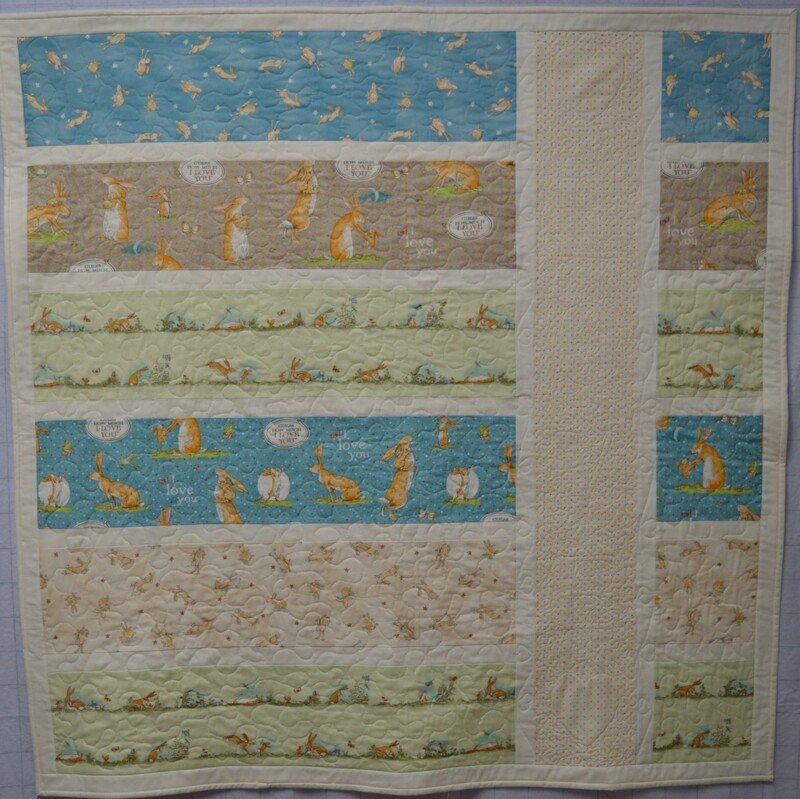 I pondered for a while about the name of the quilt, then I recalled a comment someone made on the Down the Rabbit Hole quilt page, a collective noun for rabbits is a fluffle. Isn’t that a gorgeous word! 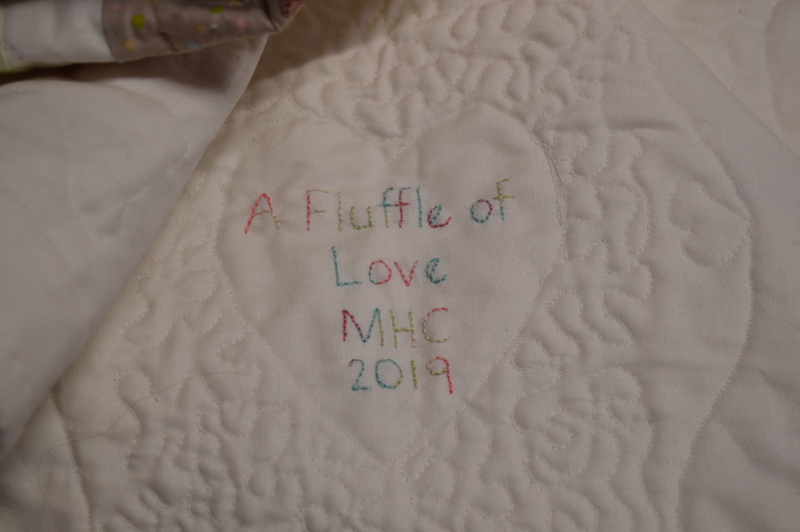 I checked on Google and it also applies to hares, I had found a name for my quilt, A Fluffle of Love, I embroidered it on the back in one of the hearts using a DMC variegated thread and then just added my initials and the year. I think I’ll buy a copy of the book and a matching cuddly toy to complete the present, just got to be patient and wait for baby to arrive! 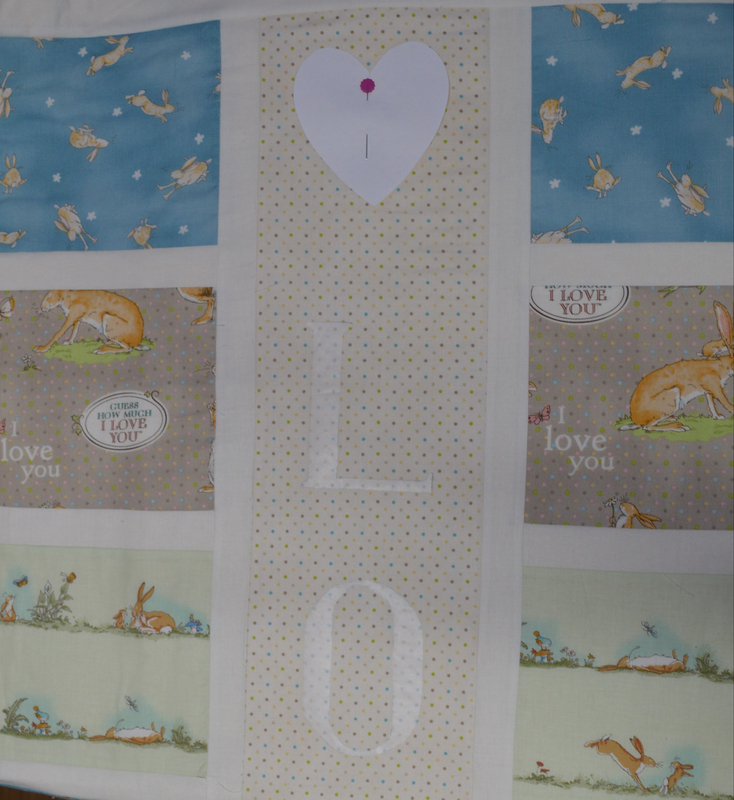 This entry was posted in Crafts, Nineteen for 19, Quilting, Serendipity and tagged Baby Quilt, Guess How Much I Love You, quilt labels, Quilting. Bookmark the permalink. This is so lovely it almost makes me weep — this will be treasured! That’s delightful, Margaret. A very special ‘welcome to the world’ present. What a beautiful quilt and such a lovely present for a new baby. Well, Great-Aunt Margaret, that’s all set to become an heirloom! Beautiful work. I became a great-aunt about 10 years ago, and the feeling passes quite quickly, by the way, it’s just lovely to enjoy another generation of family babies! That is just so beautiful, a real treasure! Touching, wonderfully named! A GREAT aunt indeed! This will be adored by all who surround the babe! So sweet! They will love it, and Baby will love his/her Great Aunt Margaret! It’s lovely Margaret, the ‘Love’ panel works beautifully. I’ve got two great nieces or nephews due this year. I’m not that close to either of my nieces but any excuse to make a baby blanket of quilt must be seized. Your fluffle is gorgeous, lucky great nephew/niece. Funny how the title of Great Aunt makes you feel old. I’m a GA to two little boys (7 years and 3 months) and a new grandma too, as you know. I don’t feel ancient lol. I echo every comment made ~ this came out so lovely, a treasure for generations to come! I am just starting a baby quilt – great grandma and I am inspired! (I am feeling quite older myself now) Thanks for the reminder to date and add my initials as it is something I have always forgotten to do ~Sharon …oh I and love the name – perfect! 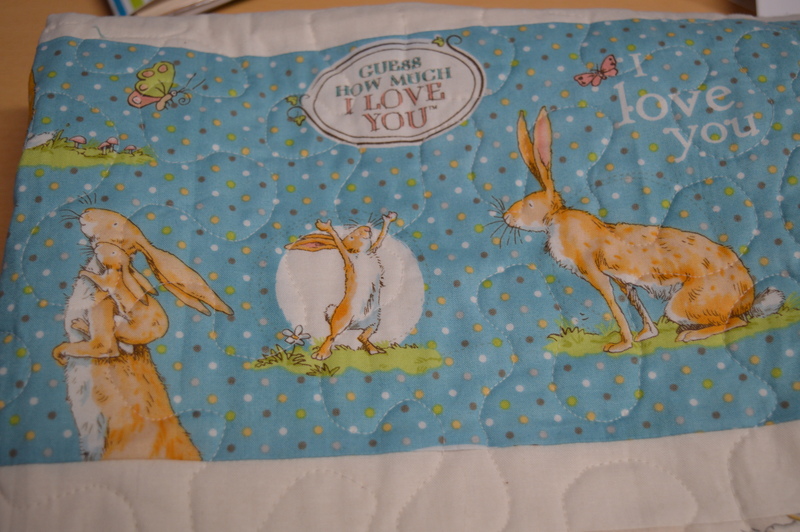 Its a splendid quilt and I’m sure the love will surround the baby and yourself. What a wonderful gift–so sweet and so full of love! I really like the use of the word “love” and the way it just sort of hides there, reassuringly in the background. Perfect! What a fantastic finish. I adore the fluffle of bunnies as well as the color palette. I used to read this story to my son all the time. I still send him a message every single night and tell him “I love you to the moon and back.” I’m sure this quilt be a treasure for the little one. Great baby gift! We used to read that book to our daughter when she was little. Perfect name for the quilt too. I learned a new word! Fluffle! That is one very lucky baby. What a beautiful and adorable quilt. What a beautiful gift, the quilt, book and toy will be much loves, I’m sure. Thank you, I did free motion the hearts, I wasn’t too sure about them at first but it all came together in the end!